Can the G-20 become a steering committee for the world's economy? Launched at a moment of panic triggered by the financial crisis in late 2008, the leaders' level G-20 is trying to evolve from crisis committee for the world economy to a real steering group facilitating international economic cooperation.What can and should such a "e;steering committee"e; focus on? How important could the c… oncrete gains from cooperation be? How much faster could world growth be? 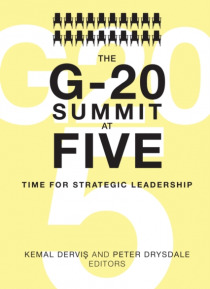 Is there sufficient legitimacy in the G-20 process? How does the G-20 relate to the IMF and the World Bank? How can Australia in 2015, and then Turkey in 2016, chair the process so as to encourage strategic leadership?The East Asian Bureau of Economic Research in the Crawford School of Public Policy at the Australian National University and the Global Economy and Development program at the Brookings Institution joined forces in putting together this volume and asked opinion leaders and policymakers from G-20 countries to provide their independent perspectives.Contributors include Colin Bradford (Brookings), Peter Drysdale (Australian National University), Kemal Dervis (Brookings), Andrew Elek (Australian National University), Ross Garnaut (University of Melbourne), Huang Yiping (China Center for Economic Research), Bruce Jones (Brookings), Muneesh Kapur (IMF), Homi Kharas (Brookings), Wonhyuk Lim (Korea Development Institute), Rakesh Mohan (IMF), David Nellor (consultant, Indonesia), Yoshio Okubo (Japan Securities Dealers Association), Mari Pangestu (Republic of Indonesia), Changyong Rhee (former Asian Development Bank), Alok Sheel (Government of India), Mahendra Siregar (Republic of Indonesia), Paola Subacchi (Chatham House, London), Carlos Vegh (Brookings), Guillermo Vuletin (Brookings), and Maria Monica Wihardja (World Bank).